Turquoise blue and chocolate brown is the new hit mix of colors. This will match all of your great outfits. 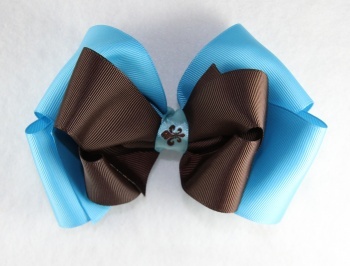 The bottom is a turquoise 2.25" grosgrain ribbon, layered with a 1.5" chocolate brown grosgrain ribbon. Wrapped together by a turquoise blue satin ribbon with a chocolate brown Fleur De Leis in the middle. This Fleur De Leis has a gold shimmering, which makes it shine in the light.